Cleaning out my studio is a challenge, but it has to be done because shelves are filled to the brim with fabric. Much of that is remnants left from the yards and yards that I have woven over the years. Going through those is like having a retrospective with each piece reminding me of the client for whom a wearable, a throw or table runner had been made. Speaking of table runners, this leftover piece just might work. I quickly stitched the ends and pulled a few weft threads to make fringe and ran it downstairs to see if it would work on the breakfast room table. Voila, success and with my favorite fake flowers it was a winning combination. A few nights later friends with whom we share meals at home were coming, and there was no question but to create a table around the newly purposed cloth. It only took a minute to determine what dishes would be perfect. 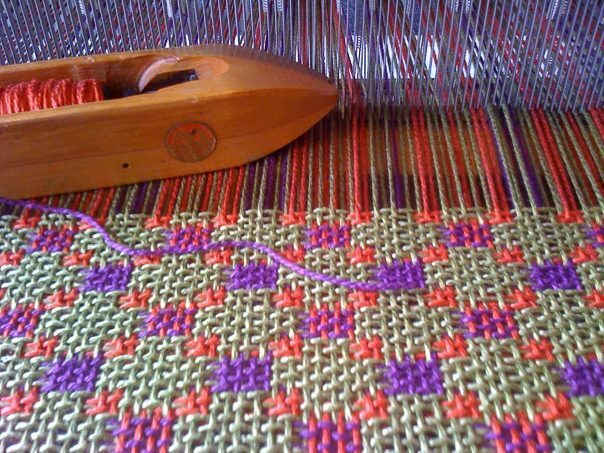 The colors mirror those in the woven piece as if they’d been made for it. Napkins were more of a problem, but folded as a pocket for flatware only the complementary colors were visible. Whew, challenge met! With the weather being a little chilly, I decided to start the meal with a shooter of warm soup. These little glasses that at one time contained a salted caramel mousse from Costco work great for that purpose. The hubby also likes to use them for what he calls a wee dram meaning a taste of scotch on a winter evening. Nothing beats multi purpose! So, what was about to become trash is recycled and opened the door to new possibility. The same will not be true for every remnant in the studio! oh Linda, your table is truly a work of art! Stunning colors, your fabulous woven runner, and the flowers that look like a modern art sculpture! Beautiful!! Beautiful runner.. perfect napkins.. devine plates..lovely flowers.. You have done it again! The apple dapple cake was loved by all!! Linda, the colorful runner is beautiful with the lovely dishware! Another perfect setting! Linda, please give me the diameter of that table. I’m trying to get the right size for Tulsa…..For Bridge, Mahjong and dining for four. Thanks. Beautiful colors on your table setting. Beautiful table setting. Love the way you repurposed and pulled in your other items to make it work. It is always great to see a good repurpose story. You really do have a treasure trove there! I was happy to be able to save at least one piece of cloth! Thank you. I was very happy to find a purpose for this remnant rather than bagging it for the trash. Your table couldn’t have turned out better if you had woven something special for the occasion. Thank you. It was a happy accident! What a beautiful tablescape! I love how it all came together!